Our Post-production Producer and in-house comedy guru. No. Well, not that we know of. But we did start hearing strange reports from building security about an unhinged Australian stalking the halls with a camera. Turns out Pete has a secret life as an online comedian. Wow, where did he learn that? Well, Pete has a graduate diploma in visual effects and also had his own production facility and rental house in Australia, and he ran the technical end of several large TV series, before moving to the UK. Oh. Well, lots of those TV shows were comedies, and that’s where Pete developed his secret passion. Aside from wanting to produce great content, part of Pete’s reason for moving to London was to tap into its rich comedy scene. On any night of the week you’ll find him at one of the many underground comedy clubs, soaking in the freshest new acts or, as of last year, on the stage himself. A moonlight comedian, hey? What about his day job? Pete’s cleverly managed to merge his two passions by producing a series of sketches, which he’s been trickling out through his ‘& Wells’ Facebook page. 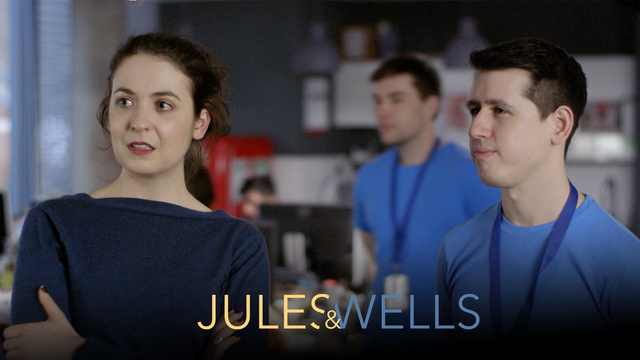 It’s called ‘& Wells’ because each sketch is a collaboration with a different comedian or actor, with Wells being the one constant. A regular collaborator is Julia Harari, an actor and fellow Aussie who has co-written a number of sketches with Pete. So, the big question – what’s his stuff like? In that case, let’s finish with his most recent video, which suggests a new approach to workplace equality. Filmed in the Adjust Your Set offices and featuring a number of staff as ‘background talent’, it was also directed by our in-house Senior Creative Robin Geradts-Gill and graded by our colourist Gabi Mascarenhas. Ah, the perks of working for a cutting-edge creative agency!